Beautiful Katherine Gorge, Northern Territory, Australia. You don’t need a tent or a 4WD to make the most of the Top End, says Jennifer Ennion, but you do need a sense of adventure. If you’ve always thought of the Northern Territory as somewhere that’s a little too challenging, perhaps a tad rough around the edges and too expensive to visit anytime soon, then it’s time to bust some myths. There’s plenty to do in the Top End for comfortable travellers on a budget, just follow our guide. From iconic Mindil Beach Market to the artillery at Darwin Military Museum, Australia’s northern-most capital is a true example of a city that has something for everyone. If you’re there on a Saturday, one of the best places to start your day is at Parap Village Markets, which run from 8am ‘til 2pm all year. Not only will you get to see one of Darwin’s hippest suburbs at its best but you’ll be able to enjoy a mid-morning snack of Thai desserts and tropical fruit that won’t break the budget. Arrive early to nab nearby street parking (it’s free) and a table in front of your new-found favourite food stall. Before lunch rolls around, head down to Darwin Waterfront for a dip in the lagoon. It’s a safe place for a swim, it’s free and it has relaxing beach vibes that will see you throwing a towel down under one of the waterside palms. Or, you can chill out on a sun lounger at the wave pool (just $7 entry for adults), just a skip across the park. Parking is metered, so take the free waterfront shuttle that operates between hotels and other precinct attractions. When it’s time to eat again, you can pick from the numerous cafes at the waterfront, or make your way to Roast and Noodle 328 in the city centre for a cheap and delicious meal of Hong Kong-style roast duck and barbecue pork. Check out other affordable eateries here. While you’re in the CBD and needing to burn off lunch, expand your historical knowledge on a Darwin Audio Tour. They’re self-guided walking tours that kicked off (pun intended) in July 2018, and all you need is an app ($2.99) and headphones. If you want to delve deeper into the NT’s past, be sure to allow at least an hour at Darwin Military Museum, where you can learn about the 1942 Bombing of Darwin; entry is $20 per adult. If you time your visit for a Thursday or Sunday, be sure to spend dusk at Mindil Beach Sunset Market, held between April and October. The markets (4-9pm) are a Darwin institution and a top spot to enjoy an easy, cheap dinner of Indonesian, Indian, Thai, Turkish or Sri Lankan fare (try the croc tacos and finish with mango sorbet). The foreshore becomes crowded, so again arrive early to take advantage of free parking and prime sunset views. Although there is a tonne to do in the city, you’ll want to make sure you get out of town. One of our favourite places is Berry Springs Nature Park, 50 minutes from the CBD. The park’s selling point (aside from the fact there’s no entry fee) is its brilliant-blue creek, to which there are a few man-made entry points. Pick your favourite and succumb to the refreshing water for an hour or so. It’s de rigueur to float with a pool noodle but we suggest taking an inflatable ring for serious chill factor. A little further along is one of the Top End’s most popular destinations – Litchfield National Park. 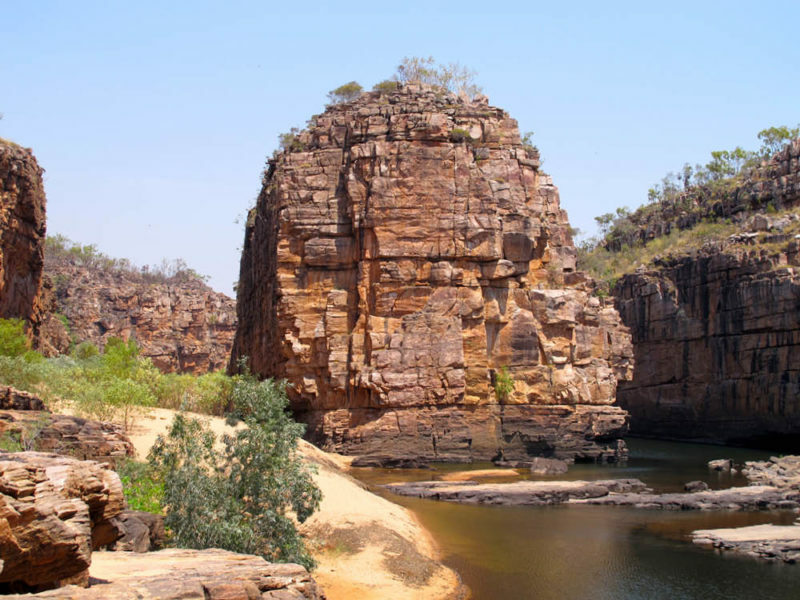 No matter what time of year you visit, Litchfield, 120km south-east of Darwin, is a sight for sore eyes, with stunning waterholes you can swim in during winter and thundering waterfalls worth watching in summer. Wangi Falls is a must-visit, with its double waterfall, large swimming pool and walking trail. There is also a café near the entry for an easy post-splash lunch, or you can throw down a rug and have a DIY meal on the large grass area nearby. You don’t need a 4WD to enjoy Litchfield, but if you’re a cautious driver and want to play it extra safe on the roads head to easily accessible Florence Falls. There’s a paved road into a large car park, from which you can then walk to a lookout or down a stairway to the falls. Easy peasy. A stunning waterfall in Kakadu. Image via Jennifer Pinkerton. Like a mirage, Kakadu National Park is easy to dream about but always seems to be just out of grasp. But there’s no need for it to be. Kakadu is open year-round and accessible for non-campers and non-4WDers – and most attractions won’t cost a cent. Interstate visitors can hire a car from Darwin International Airport and arrive in Kakadu in less than three hours. Although Kakadu isn’t as remote as people think, you will need a sense of adventure as the place will open your heart and mind to the phenomenal beauty of one of Australia’s most famous national parks. Wake early before the heat and drive to Ubirr, where you will be awestruck by both the well-preserved Indigenous rock art and the never-ending views of the floodplains atop the rock escarpment. Aboriginal rock art drawings at Ubirr, Kakadu, Australia. If you want to tackle a hiking trail but don’t want anything too serious, the rainforest walk to Maguk Waterfall is a great option, with a stunning waterhole to swim in at the end. Pack a picnic and take an inflatable ring (or pineapple) to make a morning of it. Arnhem Land, in the north, and Katherine, further south, also make up the Top End and are worth visiting if you have an extended holiday. East and West Arnhem Land are where you’ll get to experience authentic Aboriginal culture, with fishing, conservation, Dreamtime and adventure tours aplenty. This is a remote area, though, so tours will put a dent in the budget (check them out here). To save on dollars, a good option is to go birdwatching in the Gayngaru Wetlands, which has free entry. You can also set off on your own to explore some of the most remote beaches in Australia, albeit the world. All visitors to Arnhem Land are required to get a permit from the Northern Land Council. Blue sky and cliffs reflected in the Katherine River in Nitmiluk National Park. 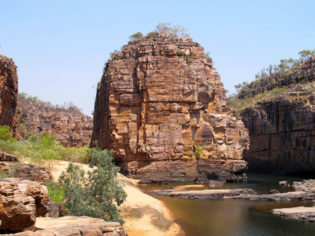 As for Katherine, your main port of call should be Nitmiluk National Park (also known as Katherine Gorge). The park is around three hours’ drive south of Darwin and features 13 beautiful gorges you can explore via canoe, speedboat or on a cultural cruise. One of the highlights and budget-friendly options is swimming at Leliyn (Edith Falls), where time can easily slide by as you soak in the plunge pool in the shade of pandanus palms. Although Katherine, the third-largest town in the NT, doesn’t offer much itself, it’s a good base for visiting the thermal pools of Katherine Hot Springs, Bitter Springs and Mataranka. You don’t have to stay at a hostel to have a cheap holiday. Darwin has a huge variety of accommodation choices that won’t require re-mortgaging your home. Our pick is DoubleTree by Hilton Esplanade Darwin, which claims to have the largest outdoor swimming pool in the city. Rooms have recently been refurbished and you can expect to find one for around $130-$150 in low season. Berry Springs is an easy morning excursion from Darwin, so there is no need to check out of your city hotel, however if you want to head to Litchfield, it’s worth staying nearby to miss the dry-season crowds. The place to base yourself is in the national park and you don’t need to pitch a tent or own a caravan to do so. From Darwin, you can hire a mid-range motorhome with a kitchen, shower, toilet and comfortable beds. All you’ll need to do is find a campsite, park, and, voila, accommodation sorted. If you’d rather shy away from a campground, the four-star Litchfield Motel, from $150 a night (low season) at nearby Batchelor is an easy option. Jesus birds, Yellow Water Cruises, Kakadu. Image via Jennifer Ennion. If you’re not camping, accommodation is limited in Kakadu, however there is Cooinda Lodge, an all-encompassing resort that offers motel-style rooms as well as campsites. Cooinda is the perfect Kakadu base, as it’s located in the centre of all of the must-see natural attractions and it has two pools to cool down in at the end of a day of hiking. When it comes to finding somewhere to sleep in Arnhem Land, the best option is to pitch a tent, however for non-campers there are a few wilderness lodges. Wiligi Outstation has a rustic log cabin – and stunning ocean views – and is open in the wet and dry season. Groote Eylandt Lodge is another great option for comfortable travellers on a budget, with bungalows and hotel-style suites, as well as a restaurant, pool, gym, day spa and art centre. There is a large range of budget-friendly accommodation in and around Katherine, and our pick is ibis Styles Katherine Hotel for somewhere reliable but easy on the wallet. The Top End is on plenty of Australians’ bucket lists but a belief that it’s remote sees us putting it in the too-hard basket. But we needn’t do so, with the region incredibly accessible thanks to regular flights into Darwin International Airport. Qantas, Jetstar, Virgin Australia, Tigerair and Airnorth all service the airport. Summer is the low season due to the rains, so it’s the best time to nab a flight special. Be inspired by the wet, with our guide to Kakadu here. The Top End is a great self-drive destination (check out our guide) and the easiest way to have a road trip is by flying into Darwin and hiring a vehicle there. That will save you fuel costs and long driving days on your way to the NT. If you’re up for the drive, however, and have time, you can reach the Top End a few ways. A popular route is heading up the Stuart Highway from South Australia, stopping in the Red Centre and Katherine along the way. You can also get there via Barkly Highway, via Mt Isa, from Queensland, and Victoria Highway from Western Australia. It’s worth noting that just because you’re driving, doesn’t mean you need a 4WD. Around 95 percent of the NT’s top attractions can be reached by sealed roads. The best way to save on costs is to take advantage of public transport, such as buses. Not only will you feel like a local and see beyond the main arterial roads, but you’ll also save money. If you’re considering hiring a car, look at a motorhome instead. There’s a Britz depot in Darwin, where you can find a home-on-wheels to suit your budget.